Ford surged higher yesterday, but the momentum isn't showing staying power. No two ways about it, 2018 has been an awful year for car stocks. As buyers and sellers battle it out this afternoon to keep the S&P 500 above breakeven for 2018, car-related stocks have been crushed year-to-date. Since the calendar flipped to January, the S&P 500 Automobiles Index has shed more than 24% of its value. Despite that slump, shares of Ford Motor Co. (F - Get Report) have been attracting big volume in recent sessions, due in part to the nearly 10% surge in shares Ford saw yesterday as the market bounced. And today, Ford is holding up well in spite of strong selling pressure in the broader market. That recent show of strength, coupled with a steep discount on shares from the beginning of the year might be luring investors looking for opportunities amid the correction. But it makes sense to steer clear of Ford - at least for now. 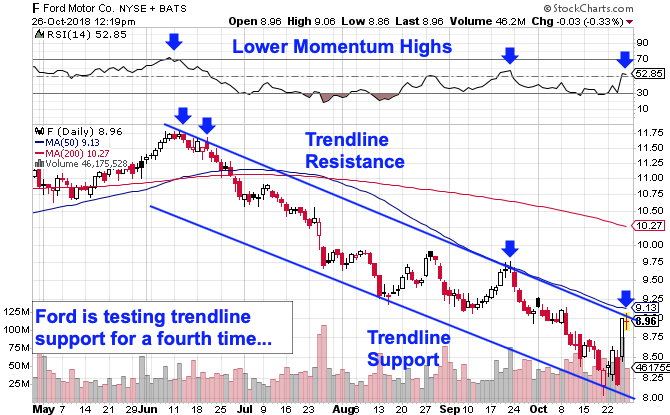 It doesn't take a trading expert to figure out that Ford is in a downtrend. Shares have been selling off in an extremely well-defined downtrending channel since the beginning of June, plunging on every test of trendline resistance to-date. Now, as Ford tests trendline resistance for a fourth time, buyers should beware. In fact, Ford's surge higher yesterday put shares right at resistance, making downside from here look like the high-probability trade in the intermediate-term. That's confirmed in part by momentum, measured by 14-day RSI up at the top of Ford's chart. Our momentum gauge has made lower highs in June, September, and again now, signaling that buying pressure has been waning even as shares sit near October's highs. Make Money on Closed-End Mutual Funds. TheStreet's Robert Powell recently hosted an all-star panel of experts who explained everything you need to know on closed-end mutual funds, and often-overlooked investment class. Click here to register and watch for free. The 50-day moving average has been a strong proxy for resistance since the middle of this summer. That makes it a valuable tool to figure out Ford's trend going forward - until Ford can catch a bid materially above the 50-day, shares remain in a downtrend and you don't want to own them. It's worth pointing out that Ford isn't alone in its trend right now; the rest of the automaker industry (save, perhaps for Tesla Inc. (TSLA - Get Report) ) is posting very similar price action here. But the recent surge in trading volume in Ford this week makes it worth paying attention to. Until Ford can break free of its downtrend, bulls should steer clear.